Car Clinic MOT Centre stocks a wide range of Continental Tyres. Continental describe themselves as the premium tyre brand you can trust. Continental has been moving tyre technology forward for more than 140 years. Their German engineering that delivers superb braking, handling, performance and safety and they pride themselves on their technical excellence, innovation and design. 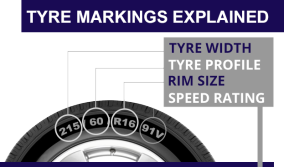 Your tyres are the only place where your car contacts the road, and while they may all look similar, there is much more to buying a tyre than just choosing the right size. Continental’s dedication to safety ensures that every Continental tyre is manufactured with the very best quality raw materials and construction techniques. That is why they have such excellent road handling in all driving conditions. Continental tyres deliver braking excellence all year round. Continental is the No.1 tyre choice for the world’s top car manufacturers. A third of new cars made in Europe are fitted with Continental Tyres as standard. In independent trials, Continental consistently takes the top places and is a ‘Best Buy’ in consumer tests. They were announced as Tyre Manufacturer of the Year 2014 by Tire Technology International. Continental Tyres are available in a range of options including eco, premium, and sport and are available for cars, vans, SUVs and 4x4s. Here at Car Clinic MOT Centre Ellesmere Port we offer a full professional tyre fitting service, including a full range of tyres from budget to premium, fast expert fitting, wheel balancing and wheel alignment. Use our online tyre finder today or call 0151 339 0101 or 0151 339 3030 today for more info.